I know my The Science Behind… the baking process posts are a deep dive into the chemistry behind baking, and most people don’t need or want that level of detail. 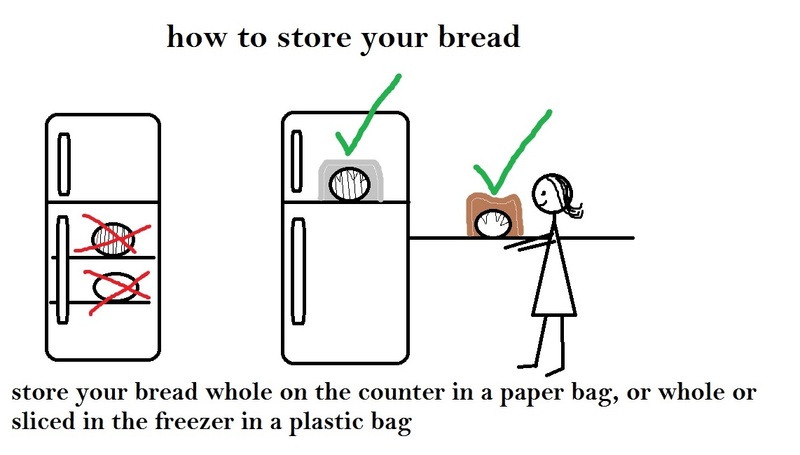 Therefore, I challenged myself to create a quick version, broken down into the component parts of a bread recipe. Each step gets one sentence. Sentences contain several clauses; I’m not that concise. Also pictures. Really, really terrible pictures made in Microsoft Paint. This is either going to be really awesome, or just embarrassing for all involved. I’ll let you be the judge. 1. 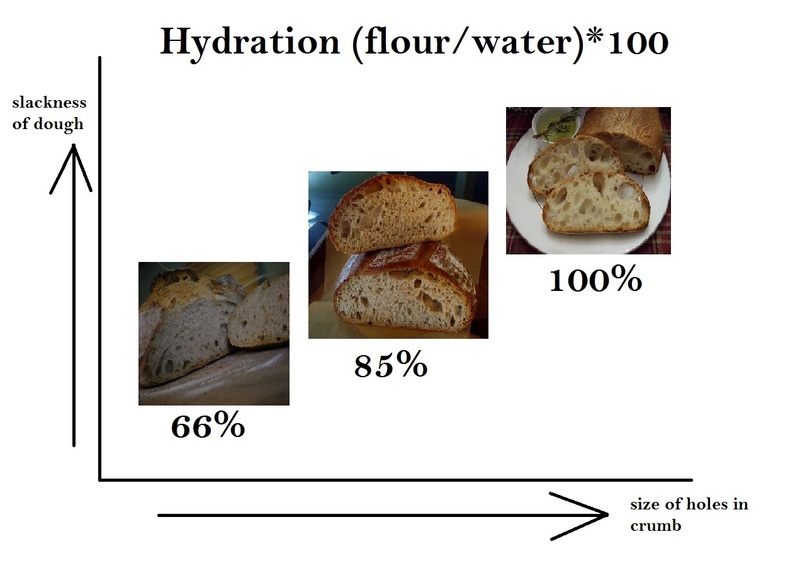 Hydration – Ratio of flour to water measured by weight; ranges from sandwich breads at 66% to french baguettes at 85% to quick breads at 100%. 2. Mixing – Weigh your ingredients using a kitchen scale for greatest accuracy and to troubleshoot; use your fingers to mix so you can really feel how the flour is absorbing the water; let it rest for ten minutes to form your gluten net (flour + water) without having to knead. 3. Kneading – Gluten net will form naturally by the flour and water if given enough time; help the net along by doing stretch and folds. 4. Rising/fermenting – Yeast eat the sugars in flour (or added sugar) and release carbon dioxide bubbles that get trapped by the gluten net and rise your dough; they also release ethyl alcohol which gives good flavor; use less yeast for better flavor and more yeast for faster rise. 5. Shaping – Not only makes your dough pretty but stretches and organizes your gluten net more uniformly; provides smooth surface for scoring later. 6. Scoring – Not only makes your dough pretty but provides weak points in the surface for the bread to expand; particularly important for doughs baked at high temperature (425 degrees F and up). 7. 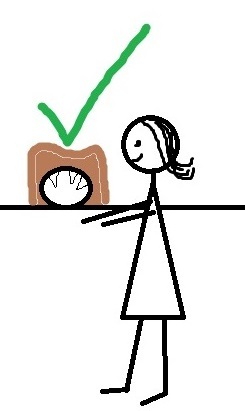 Baking – High temperature leads yeast to release carbon dioxide bubbles more rapidly, causing oven spring before the yeast dies off; water moves from gluten to starch, leading to browning. 8. Resting / staling – Wait until bread is cool to eat it; it is commonly thought that staling is caused by water loss but in fact the stale taste and texture is due to sugars slowly attempting to recrystallize into rigid glucose chains. 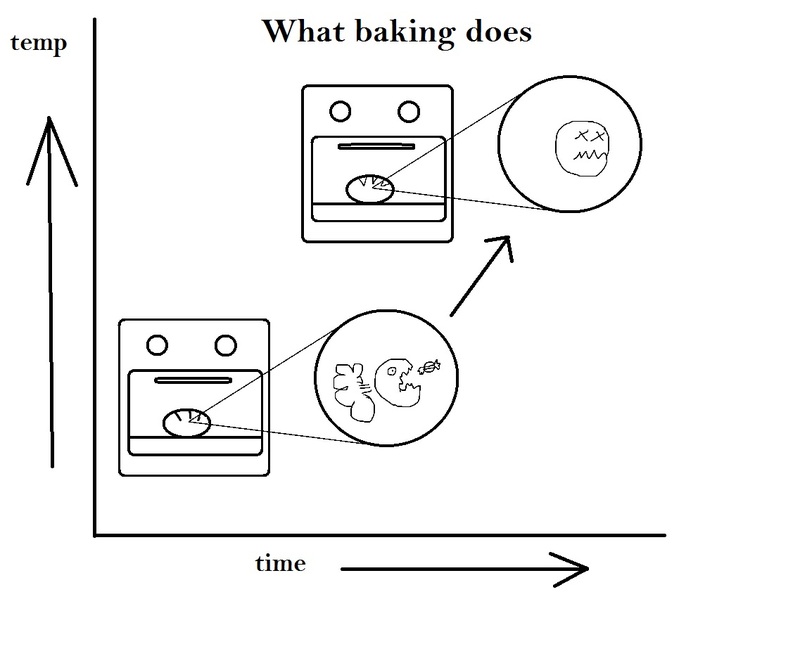 So… that’s my illustrated, one sentence The Science Behind… the baking process. Once I started creating these illustrations I could NOT stop. I hope this was helpful to you. Let me know if you liked my illustrated guide in the comments below. If you didn’t, just pretend you don’t know me and avoid eye contact in the hallway.